MOLLE external expansion system is designed to be used in combination with other equipment. You can load pockets, water bottle bag, accessory kits or other things. Ideal backpack for outdoor activities,assault,camping,hiking,trekking,traveling,combatetc,combat,etc. Please do not wash with liquid detergent or bleach. Please do not iron it. Get your money back within 90 days or get a brand new replacement. 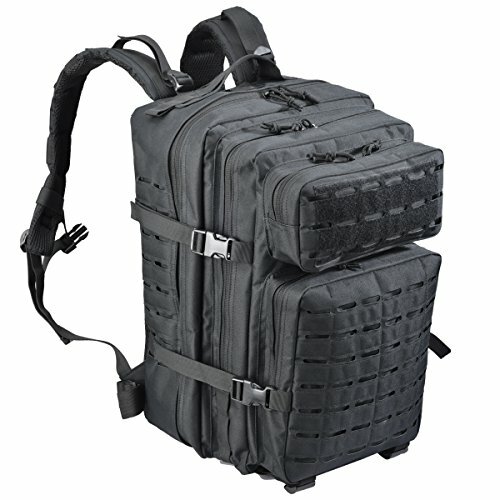 This expandable survival backpack is designed to provide superior storage capacity and organization without slowing you down.This high quality ballistic pack has a place for everything.The advanced high cushion back pad and shoulder straps allow for breath breathable ability and impact reduction. Military backpack is made of high density 600D Oxford fabric and IPX4 WaterProof fabric,durable and water resistant. Built with the adjustable shoulder strap, chest belt and hip belt, this military rucksack backpack is for heaving loading. Military backpack has hydration compatible that works great for a 2.5L hydration bladder (backpack didn't include hydration bladder) as hydration backpack or outdoor camping hiking backpack. Molle/pals system- Unique laser cut molle/pals system is lightweight, snag-free and non-water absorbing that keeps your gear safe and dry in bad weather conditions. If you have any questions about this product by SUMX, contact us by completing and submitting the form below. If you are looking for a specif part number, please include it with your message.